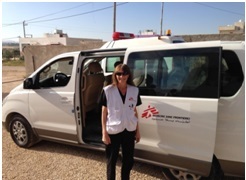 This time last year I was in Jordan working as a doctor in Emergency Medicine with Medecins Sans Frontieres. Now, back in the Emergency Department in NHS Dumfries & Galloway, I have had time to reflect on choice, selection and how this affects our lives. I have had the opportunity to exercise and walk as much as I wish and sometimes I make excuses not to; it’s my choice. It’s curious how much we miss something when we are suddenly denied the opportunity. Walking, walking obsessively walking. Since I left Jordan I have walked and walked and walked. I joined my son for about 125km on his Rhine-long walk from Switzerland to Rotterdam, I walk almost 10km daily near home, park the car in the furthest space from the hospital door, walk to buy the newspaper ( 5km ) and hiked in Andalusia, Arran, Tuscany and the Lake District. So grateful am I for my legs and the freedom to use them. The irony of my freedom to walk across Europe with no restriction unlike the felling refugees has not eluded me. I had walked past a stationary treadmill in the expat house in Jordan at least twice a day for 8 weeks after I arrived in Ar Ramtha but I have allergy to indoor exercise, I mean, why would you do that when exercise is free, right outside the front door? But then I was in Jordan, where security was an issue at our emergency mission, just a couple of kilometres from the relentless fighting in Syria. We couldn’t forget it, we heard the barrel bombs dropping and witnessed the Syrian people arriving in the emergency department as soon as they were allowed through the border to be treated. Not only had these people lost their homes, families and future, but also their immediate freedom. 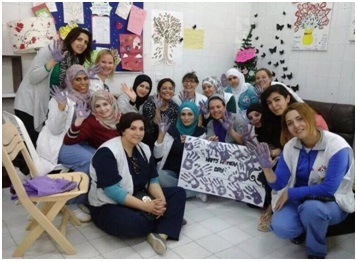 Their limbs lost or severely injured, they were treated by the surgical and orthopaedic teams and nursed with tender compassion by the local staff. It didn’t seem very long before these brave people were demanding to go to our step-down rehabilitation ward as they had heard that there was fun to be had, children’s chatter to lighten the atmosphere and general camaraderie to enjoy. Posters and slogans written in brightly coloured paints share hopes and fears encouraged by our amazing mental health team without whom the healing would take longer. Occasionally we almost gave up hope for very ill patients, struggling to hold on to life in the intensive care unit (one bed) but then I must tell you about Ahmad. We worked hard to resuscitate him and despatched him into the care of the surgeons. Long hours and careful surgical attention gave him a chance of survival and so he was admitted to our one bed intensive care unit. Tirelessly, our anaesthetist and ICU nurse looked after him and tried hard to wean him off his sedative cocktail. Without incubation he didn’t seem able to breathe alone and his oxygen saturations dipped too low for life. With some determination, he shook off urine and sputum multi-drug resistant infections (Acinectobacter Baumonii ) against the odds and eventually survived a tracheosotmy as he had been intubated really too long. He was moved to the ward and nursed with kindness and great care. Slowly, he began to respond to touch and words and finally opened his eyes and could respond with eye movements. He soon became our most visited patient with every caller giving him extra care and attention. We were worried that his nutrition wasn’t enough through the naso-gastric tube so another surgical procedure was endured to insert a feeding tube into the jejunum. This he tolerated and fed well. I even began to contemplate assessment of his ability to swallow and thought that I might cautiously see whether he might manage without the tracheosotmy. Caution was surpassed by an over-enthusiastic relative who gave him a sandwich… he didn’t choke, the sandwich stayed down and Ahmad thoroughly enjoyed it, smiling from ear to ear! He went from strength to strength, our miracle patient. Soon to be caught outside in the sunshine, sitting in a wheel chair initially but finally getting a lower limb prosthesis. 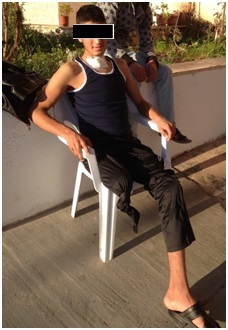 This young man, given up on by some, given a chance by MSF, would yet again walk. Indeed we both left Jordan within a few days of each other; Ahmad desperate to go back to Syria and me to return to Scotland. I tried that tiresome treadmill for a couple of weeks and quite enjoyed the challenge of a ‘bit of a work-out’. Then it broke and I felt quite cheated – never satisfied eh?